As pre-announced, AMD has begun selling its latest Ryzen Threadripper 2950X processor. The new CPU features 16 cores and is aimed at high-end desktops that can be overclocked for additional performance. 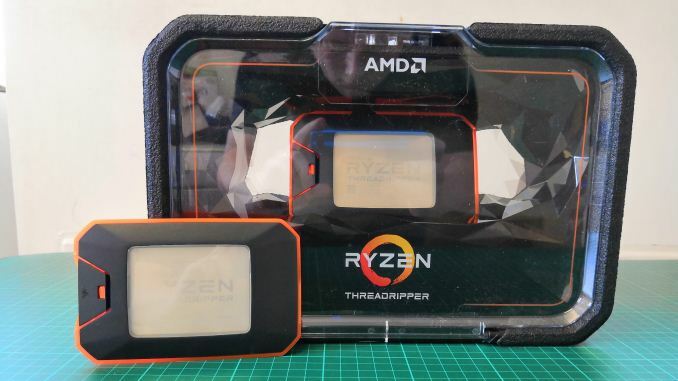 And with half the cores, the new CPU is priced accordingly, with a price tag half that of AMD’s flagship Ryzen Threadripper 2990WX, its sibling counter-part meant for extreme workstations. The AMD Ryzen Threadripper 2950X processor relies on two eight-core Zen+ dies fabbed using GlobalFoundries’ 12LP process technology on a single piece of substrate. The CPU thus offers 16 cores featuring SMT technology and running at 3.5 – 4.4 GHz, featuring 32 MB of cache, a quad-channel DDR4-2933 memory subsystem, and 60 lanes of PCIe Gen 3. With a TDP of 180 W, the Ryzen Threadripper 2950X is compatible with all AMD X399-based platforms featuring sTR4 sockets. Meanwhile, since these chips are designed to be overclocked, they can benefit from motherboards with high-quality VRMs and more robust cooling systems, as the TDP of overclocked CPUs can skyrocket well above their regular power envelope. AMD’s Ryzen Threadripper 2950X is now available from all leading retailers, including Amazon and Newegg for $899, which is actually cheaper than the price of AMD’s 16-core Ryzen Threadripper 1950X processor when it was launched about a year ago. "the new product costs exactly two times less than..."
Two times $1799 = $3598. This much less than $1799 is $-1799. 2 * < $1799 = < $3598. "... using GlobalFoundries’ 12LP process technology on a single piece of substrate." So does this mean the 2950x doesn't have 4 dies like the previous models?